I wasnt sure I was going to like not having a tube to squeeze but this has not been a problem. For putting it in my shorts it spreads easily and has lasted during my hour to hour and fifteen sprinting class. Prior to using this I was having some problems. Doc's is my favorite chamois cream because its higher viscosity makes it easy to apply and helps it hold up well on long rides. It has a pleasant herbal scent from tea tree oil, which (along with witch hazel) soothes your skin and prevents infections. The cream comes in 8oz jars and is relatively economical compared to some other brands that cost the same for just 4 oz. This is the first real chamois cream I ever tried and don't feel the need to try anything else. It just works for me, doesn't smell weird, doesn't have some of the major ingredients reputed as bad for your skin (e.g. petrolatum, mineral oil), doesn't stain my cycling clothes. Even after a 3 to 4 hour super sweaty ride, when I come home and shower, I can feel the chamois cream hasn't been washed away by sweat or degraded into nothingness by the heat and movement. I thought I would give this a try after being very happy with Enzo's product (also from BTD). You never know until you try it, and preferences vary for such types of products. However, I will be going back to Enzo's. I would put Doc's on par with DZ Nuts (and similar), but for me I prefer Enzo's by far. I prefer the consistency, texture, and longevity of the Enzo's product, but others might not. This chamois creme has a great consistency- not as thickhard as Betwixt and not as thin as Paceline. It also has a pleasant tea tree oil scent without the unpleasant numbing property of some Euro style blends. I probably marginally prefer Assos, but definitely don't find it worth the much higher cost. I really like this stuff. Great antibacterial properties, feels good and does what it's supposed to. Has just about the same consistency (although slightly less stiff) than the Assos stuff. However, for the same price, you get twice as much. I have used Doc's chamois cream for years. Great stuff I don't go on a ride without it. 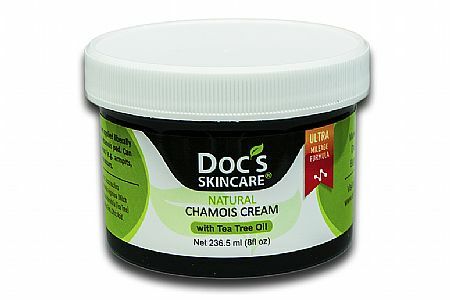 Doc's is my favorite chamois cream...by a considerable amount. I'm sure I haven't tried them all, but I've tried many. When you first dig into it, seems like maybe it's not going to be all that great, like it's almost too thin, but then it ends up working longer and better than anything else I've used. The only downside...the stuff can be hard to get sometimes. I try to have a back-up on hand because I've run out before and couldn't find any at all, even direct from Doc's. Of the best, if not the best chamois creme out there...especially for the price!